A ROUND WOODEN PEDESTAL,STAND,TABLE,POT PLANT STAND. All faults are clearly described. Our policy is to standardise as much as possible. 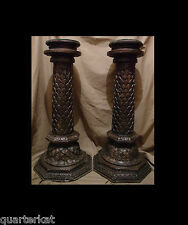 Here we have a wonderful pair of wooden barley twist torchere/jardinière/pedestal stands! These are gorgeous pieces, the twist is chunky and made from a wonderful wood, the photos don't do it justice. Here we have a oak gothic church display stand. Size approx. widest point's. Base 15.75" x 15.75". overall a very hard to find piece with a great look. Top 15" x 14.75". Here we have a lovely solid wood torchere/jardinière/pedestal stand! I use new & recycled materials to ensure that your item arrives to you safely. WOODEN STAND IS IN GOOD STURDY CONDITION. IT CAN BE FOLD FOR EASY STORAGE. THE HAND MADE LACES ARE 13 CM IN DIAM AND ALL IN VERY GOOD CLEAN CONDITION. (Finish Black lacquer. longcase clocks). Beautiful tall stand made of dark wood. Antique Wooden Plant Stand. The furniture is over 100 years old. H APPYB IDDING!!
. Ready For Display In Your Very Most Prized. ! The. Most Wondrous. Of. ! Modernist atomic. Wooden very beautiful. It is a magnificent room of decoration to furnish. COFFEE TABLE.